Ideal intergenerational or multi-family compound with large pool, main house has master BR with king bed, TV & sitting area; second kitchen behind main kitchen/dining/living area. Guest house has 4 br's and 2 baths, a queen room and a twin room on each floor. Each bedroom has its own sink and there is a toilet room and a shower room on each floor. There is an additional room with outside entrance on the first floor that we call the quiet room with a queen futon and chairs for reading. We do not advise using it as a sleeping space.. Outdoor hot and cold showers, washer/dryer room, large deck with 2 grills overlooking pool, lawn bowling, croquet area, 2 hammocks, very private setting but only 2+ miles from Lambert's Cove Beach . 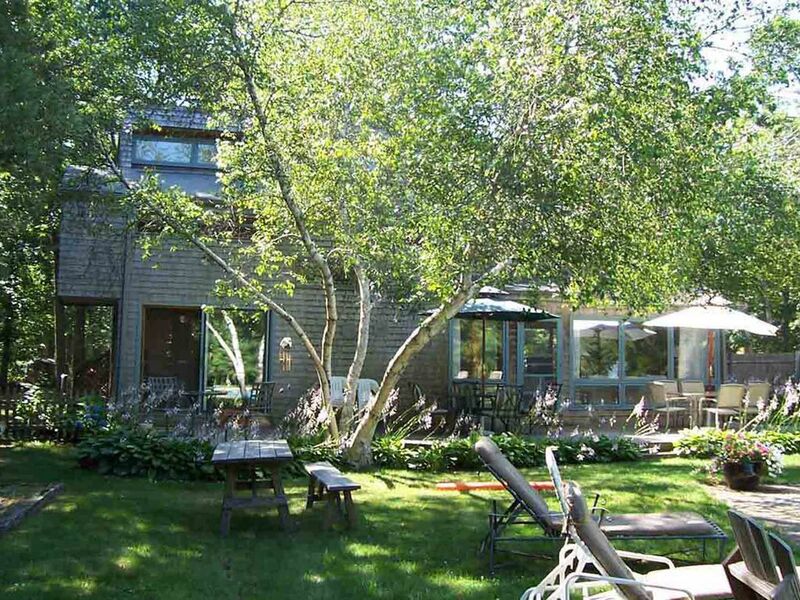 House is ideally situated, close to Cronig's up-island supermarket, and Tisbury and West Tisbury shopping areas. Being right in the middle of the island allows easy access to Menemsha sunsets, many art galleries, Ally's general story, West Tisbury library, farm stands, and equidistant from Oak Bluffs and Edgartown. This is the quiet part of the island and a wonderful retreat from the hustle and bustle of the Vineyard in the summer although you can easily access the crowds and shops. No linens or beach towels are provided although beach chairs are available. Loved this home-perfect for a big family, great location and the pool was wonderful. Hope to enjoy it again. The house was organized, well designed and perfect for my family. There were board games like checkers, uno, connect four, etc. The owner was thoughtful and even had games for the pool. I liked the layout of the guest house bathrooms. I would return every year. Great pool! Open floor plan for family to gather. Great house, pool and yard. Nice place to relax. Location is a bit remote.